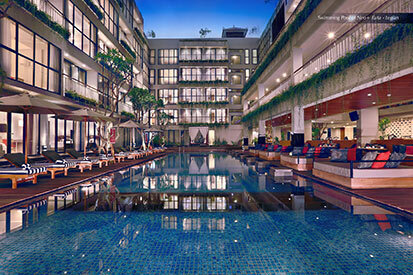 Bali, January 22nd 2015 – Following the openings of the hotel NEO – Kuta Jelantik, hotel NEO Gatot Subroto and Hotel NEO Seminyak Petitenget, Archipelago International continues to cement its place in the Bali select service hotel scene with the launch of another NEO in Legian. The new hotel trumps its predecessors in terms of guest room seize and facilities earning it a NEO designation in tune with international 3 star standards. 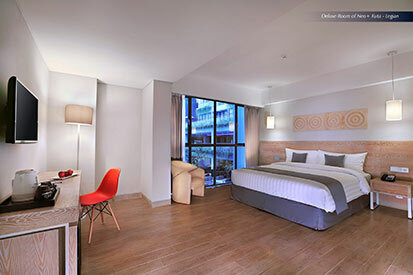 The new Hotel NEO Kuta Legian enjoys a perfect location for lovers of Kuta’s nightlife and shopping being that is just down the road from Ground Zero and the popular Sky Garden Club on Jalan Raya Legian yet remains tugged away in a quaint and peaceful side street locally referred to as Jalan Troppozone. With a modern, contemporary and youthful design and a superb curt yard pool paired with expert service from a hands-on, dynamic team, the hotel is both proficientl and fun promising stylish but reasonable priced accommodations for the twenty-first century traveller. The 117 funky, stylish and smoke-free rooms come with a choice of double or twin beds, outfitted with top of the line linens, cutting edge flat-screen satellite TVs, super cool air-conditioning, mini-bars, safes and en suite bathrooms with large standing showers. Wi-Fi access is fast, reliable and as in all NEOs free and available throughout the entire hotel. Two well-equipped meeting rooms, a cute little café shop specializing in homemade noodle dishes and a gorgeous spa with well-trained therapists make the NEO one of Bali’s most complete boutique budget hotels. The outdoor swimming pool, surrounded by a spacious sun terrace with plenty of loungers and a poolside snack bar serving much needed refreshments, finish off the tropical hotel with a cool island vibe. “With NEO and NEO Hotels focusing on fashion conscious Millennials there could not be a better location for our 4th NEO in Bali and the first slightly more upscale NEO then the very heart of Legian. The hotel already received votes of confidence during private pre-screenings we’ve conducted for Japanese and Australian top tour operators and will surely be an awesome success. Right after this we will rush to Penang where the next NEO is due to open the heart of Georgetown” said Norbert Vas, Archipelago International’s VP of Sales & Marketing.